Figure 1. 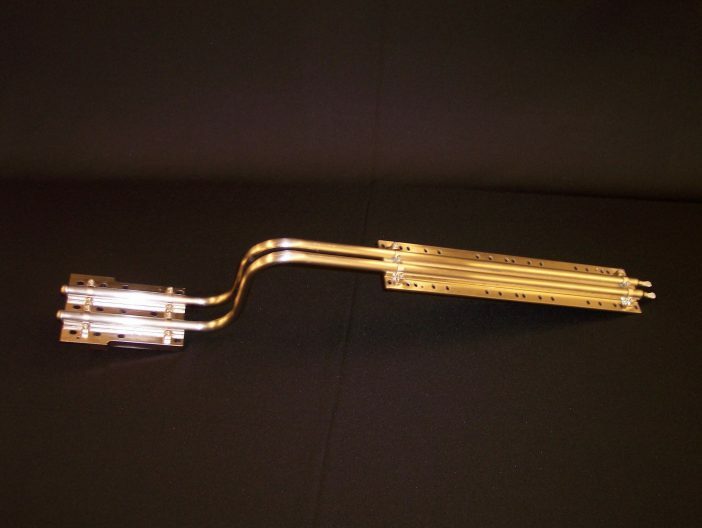 Ammonia and methane/ethane heat pipes for spacecraft thermal control use an aluminum envelope with extruded grooves for the wick. Essentially all ammonia and ethane Constant Conductance Heat Pipes (CCHPs) for spacecraft thermal control use a grooved aluminum envelope/wick extruded through a die. Grooves have the largest pore size of any heat pipe wick, coupled with the highest permeability. The high permeability allows spacecraft CCHPs to be up to several meters long, as opposed to screened/sintered wick copper/water heat pipes, which are typically less than 10 in. (25 cm) long. The disadvantage of grooved wicks is that they can only operate with a very low adverse elevation (condenser over evaporator). These CCHPs are typically tested with a 0.1 in. (2.5 mm) adverse elevation during ground testing; increasing this elevation by 0.010 inch (0.25 mm) significantly reduces the power. Typical grooved aluminum heat pipes are shown in Figure 1. In addition to the grooves on the interior, the envelopes have integral flanges, used for supplying and removing heat from the heat pipe. Dual bore extrusions are used for both higher power applications, and when redundancy is required. 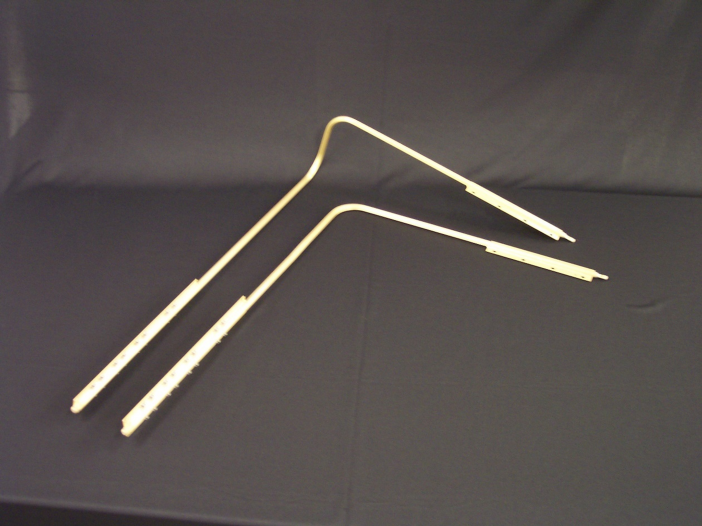 They can be bent both the hard way and the easy way, as shown in Figure 2. Figure 2. Dual bore extrusions and be bent both the hard way (left) and the easy way (right). Figure 3. The flanges are machined away to allow the heat pipe to be bent. Spacecraft CCHPs often have multiple evaporators and condensers, as shown in Figure 3. In addition, multiple bends are often required to bend the heat pipes around other components in the satellite. The flanges must be machined away where the pipe is bent to reduce stiffness, allowing the bend to be made. The flanges are also machined away in the adiabatic sections, to reduce mass. Several of the extrusions in Figure 1 have flanges on both the top and the bottom. This allows the heat pipe to accept and reject heat from both the top and bottom. Other extrusions have a “Tic Tac Toe” cross-section. By machining away the unwanted flanges, the heat addition and heat removal sections can be oriented perpendicular to each other. If other orientations are needed, flanges can be soldered to the heat pipes; see Figure 4. Figure 4. Saddles soldered to the heat pipes can also be used. Figure 5. 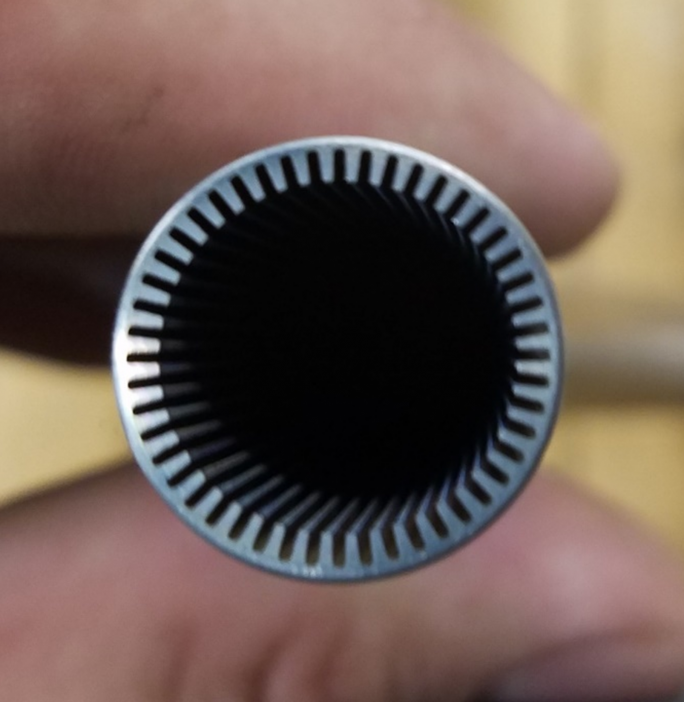 Grooved titanium heat pipe wick, formed by Electrical Discharge Machining. Aluminum has a relatively low melting temperature, so it is easily extrudable. However, aluminum is incompatible with heat pipe fluids such as water and methanol, so other materials such as titanium or Monel must be used for pipes with these fluids. Grooves are formed in these materials by Electrical Discharge Machining (EDM) or 3D printing. Figure 6. 2D (planar) heat pipes can be easily tested on the ground. 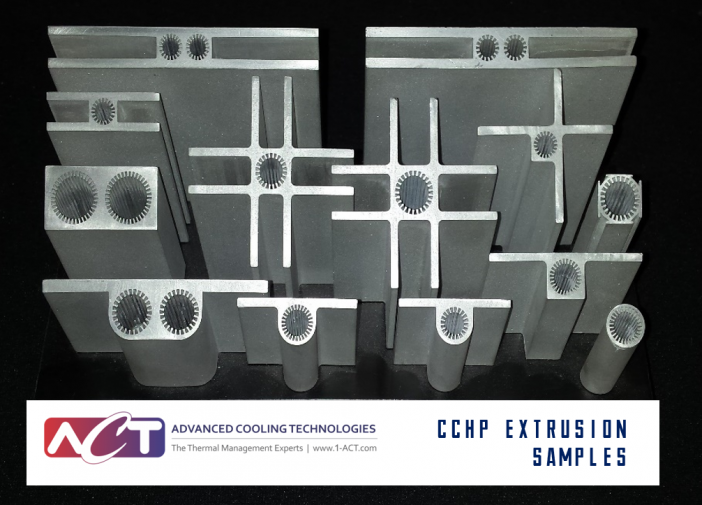 A special procedure is required to validate 3D heat pipes. As discussed above, CCHPs can be only be tested with an adverse elevation of 0.1 in. (2.54 mm). Two-dimensional (planar) heat pipes can be tilted to meet this requirement, however, three-dimensional heat pipes cannot be tested against gravity on the ground. To validate these pipes, if necessary, a 2-D heat pipe with equivalent bends is built and tested at 0.1” adverse tilt. Figure 7. Microgravity performance is estimated by testing at several elevations, and extrapolating to zero. Performance of a CCHP in microgravity can be predicted using 1-g test data. As shown in Figure 7, the CCHP is tested at several adverse tilts to characterize the curve for Heat Transport vs. Adverse tilt. 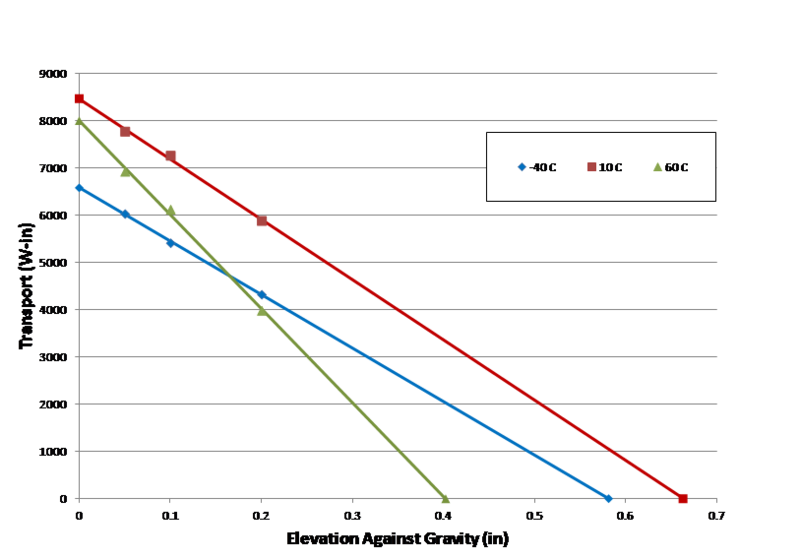 The curve is then extrapolated to predict 0-g transport capability.